Filling : Thermal Bonded Silkonized Hollow Fibre Wadding. 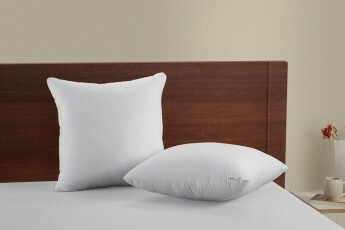 Shell Fabric : 50% Polyester 50% Cotton Fabric on top & Non Woven fabric on Bottom Surface. Quilted Mattress Protector (with Skirting) from Homescapes is specially designed to increase the comfort level & protection level of your mattress. 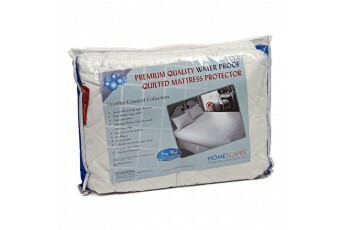 Homescapes Mattress Protectors provide superior protection, keeping your mattress clean and promoting excellent hygiene. Our motive is help to create an allergy-free sleep environment better than most other mattress covers. Non Allergenic., Fully Elasticized for a perfect fit. Easy machine washable, Tear and protects your Mattress. 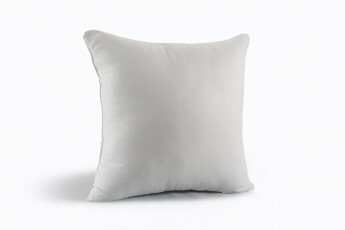 Gives new life and boosts the comfort of your old Mattress, 100% blended cotton fabric on the top. Supported with all around Skirting (fringe) which cover the height of the mattress.